2Hopkins’ penthouses give you the pinnacle of luxury at the top of the most elevated Baltimore apartments. Long an iconic piece of the skyline, 2Hopkins is now an equally impressive part of downtown Baltimore apartment living. And no aspect of this extraordinary new residence represents 2Hopkins’s elevated style better than our spacious penthouses. Set on the top three floors—the 19th through 21st—each of our penthouses brings together a master architect’s commitment to form with a modern designer’s understanding of style. First, there are the truly breathtaking views. 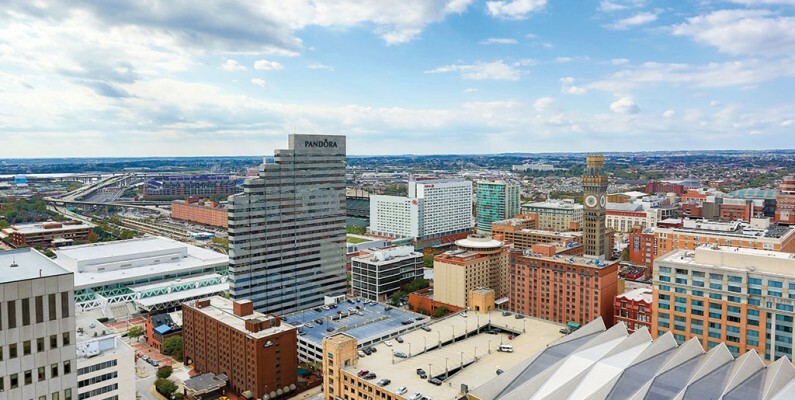 From the moment you step through your penthouse door, you’ll marvel at how completely your floor-to-ceiling windows present the beauty of Baltimore. It’s like a living work of art filling an entire wall. Complementing your views are a curated series of finishes representing the pinnacle of Baltimore luxury apartment living. Wood-style flooring extends through every room. A gourmet kitchen provides stainless steel appliances, quartz countertops and a glass cooktop. And the spa-inspired baths feature ceramic tiling and backlit vanities. Your 2Hopkins penthouse will also come with the height of modern technology. Keyless, electronic entry makes opening your door easy even when your hands are full. And motorized window blinds let you simply flip a switch to adjust the light in your home. As some of the finest Baltimore apartments ever offered, the 2Hopkins penthouses are literally the height of city living. There’s no better way to live.